Join the fight against sarcoma. Step out this Sunday, Sept. 9, for the 9th Annual Strike Out For Sarcoma 5K and Family Run. Bob Thomas, who was given a terminal metastatic cancer diagnosis nearly eight years ago, is not precisely sure exactly which cancer he survived. All that matters to him is that he’s alive and thriving, in large part, thanks to treatment he received at Duke. An avid cyclist for many years, Thomas had spent many Saturdays riding for four or five hours bent over the handlebars wearing no sunscreen; his bald head exposed to the sun. So, when the Raleigh resident’s primary care physician found a suspicious lesion on the back of his neck in March of 2010, he wasn’t entirely surprised. “They thought it was nothing and they cut it out and said I was fine to go home,” recalled Thomas, who at the time, had counted himself lucky to have come away with what his doctor said was a very treatable squamous cell carcinoma. Four months later, though, a sore spot developed behind the previous spot. That, too, was excised. This one was determined initially to be a fibroxanthoma (a superficial sarcoma) and later re-classified by Mayo Clinic as an undifferentiated neoplasm with epitheliod features — basically an unknown cancer. Thomas’ doctors in Raleigh were a little worried that the cancer had returned, and that it still wasn’t something they could exactly define, Thomas said, so they advised 30 rounds of radiation. His doctor said his “not feeling great” was probably due to simple side-effects of the radiation, but Thomas wanted to get a chest x-ray just to be sure. He floated the idea by his two-week-old son’s pediatrician while at the newborn’s exam and the pediatrician agreed. At his Thomas’ request, his primary care doctor performed the scan. “He called me soon after and said "You need to get in touch with your oncologist today; you’ve got a bunch of tumors in your lungs,"" remembered Thomas. "As you can imagine, the prognosis wasn’t good. It went from ‘it’s nothing’ to you’ve-got-a-couple-months-to-live type scenario." At that point, Thomas looked to Duke Cancer Institute in Durham. His lung tissue was biopsied. “We had a multidisciplinary conference where we reviewed Mr. Thomas’ case," said his oncologist Richard Riedel, MD. “The consensus at the time was that the pathology was most suggestive of metastatic sarcoma. Given his significant symptom burden and the need to begin therapy, the decision was made to treat it as such." Meanwhile, a lung tissue sample was sent to Memorial Sloan Kettering Cancer Center pathologists for another opinion. That November (2010) Riedel started him on the AIM combination regimen (Adriamycin® + Ifosfamide + Mesna),the most aggressive chemotherapy treatment for advanced (metastatic) sarcoma that Riedel could give him — and one which causes meaningful tumor shrinkage in only about 35 percent of patients. "Dr. Riedel promised to fight the cancer with me as long as I could handle it, but he was honest with me," said Thomas. "He said that if he treated me and it closed this disease down for three or four months, he’d consider it a success." Thomas spoke with a friend of a friend with melanoma who’d been given a month to live, but who’d already surpassed that by five years. She told Thomas not to focus on the statistics or worry about the prognosis. "I would not ask why I got cancer, but I’d make cancer say "Why did I get Bob?,""said Thomas. "I would take it head on. I was going to own it." Together with treatment, Thomas, then 42 years-old, did a lot of meditation and praying. He also went on a special diet. While Thomas told Riedel that he "felt pretty good for a guy dying of cancer," he nevertheless vowed to stop treatment if there were no visible changes to his condition. After three rounds of chemotherapy, imaging was performed. “Dr. 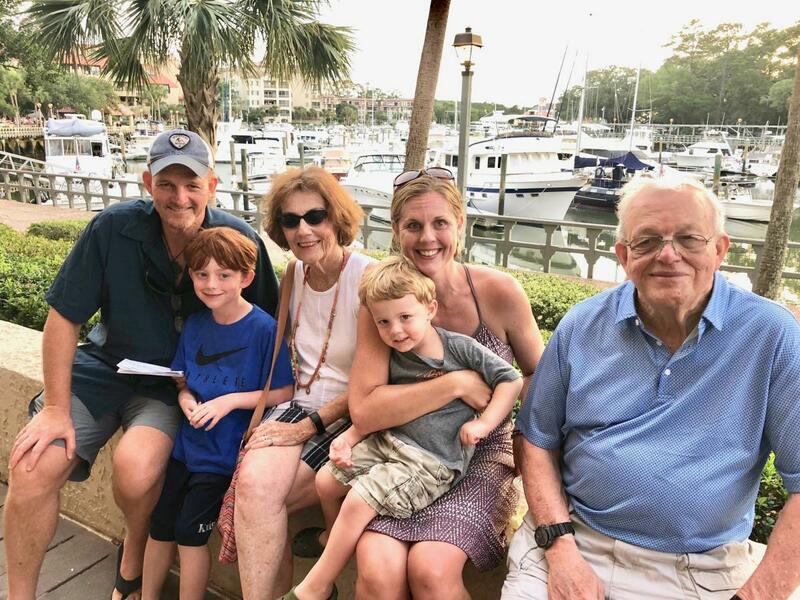 Riedel ordered the scan, and later, after getting the results, he said, "I don’t know what to tell you, but half of the cancer in your lungs is gone,"" recalled Thomas, whose cough and shortness of breath had already gotten better. Every three weeks from November through March he underwent treatments. 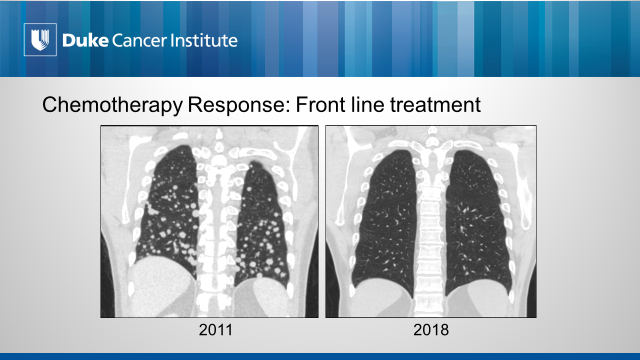 At the completion of six rounds of chemotherapy, imaging revealed near complete resolution of the previously seen innumerable small lung tumors. As for Thomas, he said he doesn’t dwell too much anymore on whether it was melanoma or sarcoma. Seven years since he was cleared of cancer, he’s busy managing his manufacturing business and keeping up with his family. The two-week-old baby that he thought he’d never see grow up is now seven years old and he now has another son, “our miracle baby,” who’s three. CIRCLE PHOTO (top) & FRONT OF BLOG PHOTO: Bob Thomas thanks God, family, friends and his oncologist Dr. Riedel for helping him beat cancer. photo by Colin Huth.